Now that you have downloaded the SDK and know how to make projects in Carbide, we will now look into our first GUI Application which prints a line of text in the center of the screen. The main goal of this tutorial is to get a feel for developing a basic application by actually building and running one on the emulator. Application View: The view class implements the application's screen display, including drawing the window and the creation of the initial screen controls. The class is inherited from CCoeControl which is fine for Applications with just one view class. We would only be discussing a single view class for now. Application UI: This class instantiates the application view and handles the commands sent from the application's GUI controls. 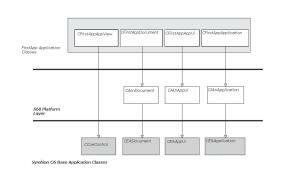 Application document: This class handles the non-GUI data aspects of the application – the application data. It also instantiates the application's UI class. Application: This class is used to identify the application (by returning the application's UID) and to instantiate, and return a pointer to, your application's document class. Now let us discuss these classes one by one. NewL, NewLC and ConstructL: These methods construct a new object of the view class. We will discuss about why we took these 3 methods and not just the constructor to construct the new object later in error handling. ConstructL(): This function does the work of construction of an object of View Class. HandleCommandL(): This function handles the commands passed from the Application's GUI controls. In this application, we just need to handle the commands for exiting the application. The document class has two purposes, the first of which is to represent the application's persistent data(Data that needs to remain after application is exited). The other is to create the application UI instance in which this data (if any) can be manipulated. For applications that have no persistent data, and therefore are not file-based, the document class simply implements the CreateAppUiL() function to return the application's UI object. CreateDocumentL(): This function creates an object of Document class and returns a pointer to it. AppDllUid(): This function returns the Application's Uid. A Symbian OS GUI application is a process executable (EXE file) and therefore must contain an E32Main() entrypoint function. For a GUI application this just calls EikStart::RunApplication(), passing it a pointer to a function that returns the application object to run. The application resource defines a significant part of how the application will appear and function. The resource file is a text file whose name ends in .rss, and is compiled into a binary form by the SDK's resource compiler. This compiled version of the resource file is loaded onto the phone along with the application executable and is accessed during application execution. The RSS_SIGNATURE resource is used to validate the file and must appear, exactly as shown below, as the first resource in every appliation's resource file. TBUF Resource defines the default document name. As a document is not used in the application, it is left blank. The EIK_APP_INFO Resource defines a Control Button Array(cba) resource that defines the function of the left and right softkeys. We define the cba as "R_AVKON_SOFTKEYS_EXIT". This defines the right softkey as exit and generates the command "EAknSoftkeyBack" when activated which is in turn handled by the Application UI class. registration resource file. The source file names are typically <application name> reg.rss. Walkthrough the reg_rss file for more details. Go to tutorial 2 now.